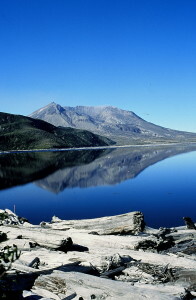 Mount St. Helens remains a stark, startling landscape in the midst of the usually green and heavily timbered Cascades with the clear blue sky reflected in Spirit Lake, the silvered downed trees, the gray behemoth rising above, and a lingering sense of human tragedy haunting the terrain. Yet, it’s coming back. Resilience wins. 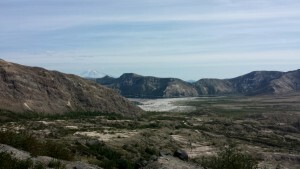 When I wrote the chapter in Hiking Washington’s History on Mount St. Helens, I included three trails from the east side since the approach to the west side of the mountain was still blocked by the devastation of the 1980 explosion. 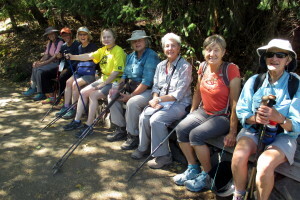 In August, 2016, I returned with my hiking group of intrepid women. Much remained the same–the mountain is still gray and fractured, the trees are still down, Spirit Lake is still half-filled with logs–but life is returning. 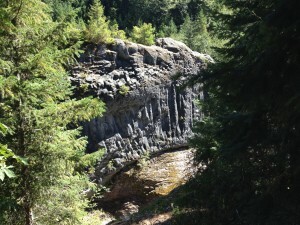 On the first day we hiked the Boundary Trail on the west side in a perfect storm of unfavorable conditions–a long drive from Seattle, the hottest day of the week (in the 90s), and starting over the exposed landscape at mid-day. Our goal was Harry’s Ridge; we reached the base of the ridge and decided that was enough. 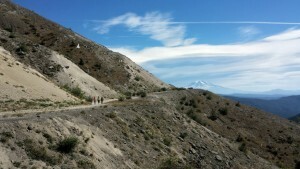 The next day we split up; four of us explored the Truman Trail, which leaves from the Windy Ridge viewpoint and travels south on a gated dirt road, then cuts across the pumice plain at the base of the mountain. The trail is ashy and sandy but broken by creeks and an oasis, providing enough alder shrubbery for a shady lunch. We headed toward Loowit Falls but turned back as clouds came over the ridges and the air turned cooler. Others in our group took the Harmony Falls trail down to the banks of Spirit Lake, which no longer has signs limiting access. 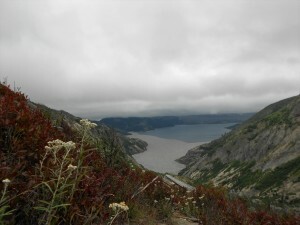 Then they climbed up to Norway Pass for the most expansive views of the mountain and for close-ups of the wildflowers. At the top of the pass, clouds had obscured the mountain. The third day some of us went underground, to Ape Cave, then to the dramatic Lava Canyon. 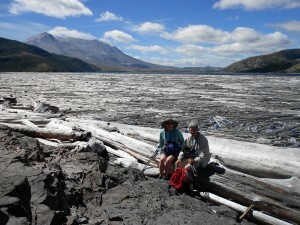 Our fourth day was a cool-down along Siouxon Creek. Wonderful hiking with resilient friends.